The Draper 106.5 x 170.5" 16:10 Ultimate Folding Screen with Matt White XT1000V Projection Surface is manufactured with CNC machined components. The screen itself features a Matt White XT1000V finish which means it has an extra wide viewing cone (half brightness @ > 60°), typical contrast for environments with controlled ambient light, and a gain of 1.0. The Ultimate Screen is a useful addition to a school or business that requires a reliable and easy-to-use screen without a permanent installation. The heavy duty wheeled case is made from polyethylene and can be used for travel. The system is easy to use, implementing Draper's locking latches which make set up and break down simple. These latches hold the fabric firmly in place and give the screen its rigidity. In addition, the latches are internal and designed to fill the entire tube giving them additional protection. The screen is manufactured with CNC components. The frame is comprised of anodized 1.25" x .070 wall aluminum tubing. Draper's latches are designed for ease of operation and long life. The locking mortise latches bite down when the surface is attached, increasing the rigidity of the frame. Latch parts are internal for better protection and they completely fill the tube for improved strength. The resilient latch retention spring is captured and constantly flexed so that it cannot be dislodged. Both front and rear surfaces have square corners. Dress Kits are optionally available. Borders are electronically welded using PVC material that provides straighter, cleaner edges. Standard Legs support the Ultimate Folding Screen in a vertical position. 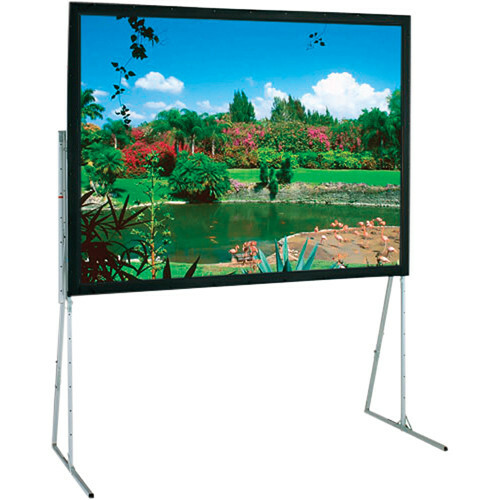 Draper's Ultimate Folding Screen with Heavy Duty Legs offers keystone control.